Chris Haslock pitched in the Padres organization from 1988 to 1991. In 172 games, almost all in relief, he went 17-14 with 26 saves and a 3.44 ERA. A fuller account of his career can be found at The Greatest 21 Days. The first Thom McAn shoe store (named after a famous Scottish golfer) opened its first store in 1922 in New York and had over 850 locations by the 1950s. As casual footwear trends changed the store failed to keep up with the times and the last Thom McAn store closed in 1996. The brand is now owned by Sears and the shoes can still be found at Sears and K-Mart. 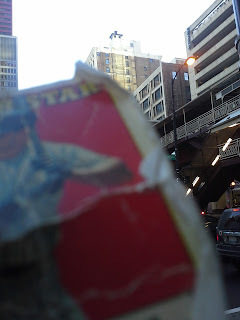 Thom McAn put out a baseball card set in 1985 - MSA JOX Thom McAn Discs. Although the stores have been gone for over twenty years old Thom McAn signs are still visible all over the country. Johnny's Trading Spot sent me a small flat-rate full of hits to my various set want-lists. He sent three Hall of Famers to knock my 1993 Triple Play set to one card. Anyone have Tim Raines, #108? ... and 1996 Upper Deck. Catcher Mark Verstandig played in the Padres and Phillies organizations from 1987 to 1991. In 262 games he hit .240 with 4 HR and 71 RBI. He now owns M&K Greenhouses in Selkirk, NY. A fuller account of his career can be found at The Greatest 21 Days. I already covered Harvey's in the 1987 set - very similar picture here. Found a few "ghost signs" in my visit to Chicago. The Boston Store was a department store that opened in Chicago in 1906. The store was bought by Federated Department Stores in 1948 and was close soon after. 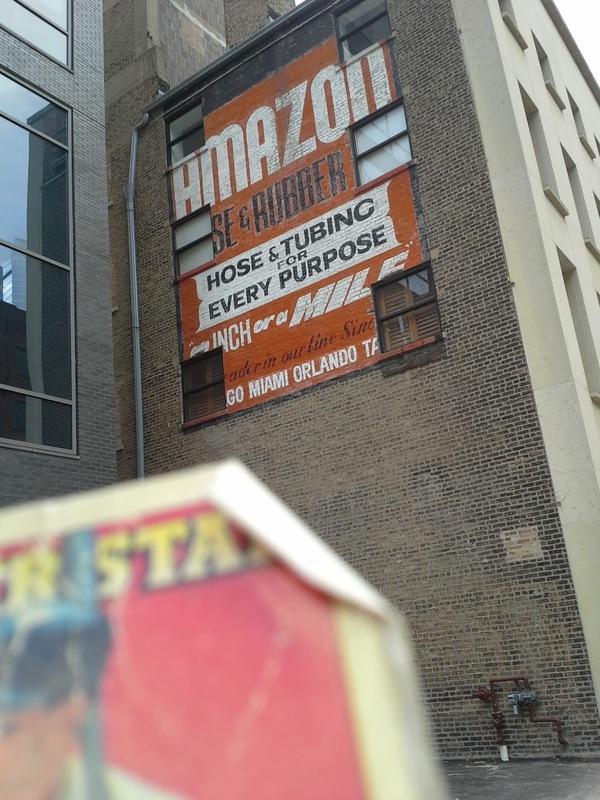 Amazon Hose & Rubber opened in Chicago in 1919 and is still in existence today at three Florida locations. They no longer exist in Chicago, however. Looks like windows were added to this building some time after this sign was painted. If you zoom in to the top of the building in the center of this photo you will find a realty sign with an old phone exchange - HA7-2554. You can see a clearer photo of the sign here. Barry Hightower pitched in the Mets and Padres organizations from 1984 to 1988. In 71 games he went 11-13 with a 5.36 ERA. This picture must have been taken right up the food court from the previous one, but the store didn't bother to give Hightower anything with the store's name on it. I like how the photo shoot apparently didn't disturb the lady having her meal right next to hiim. 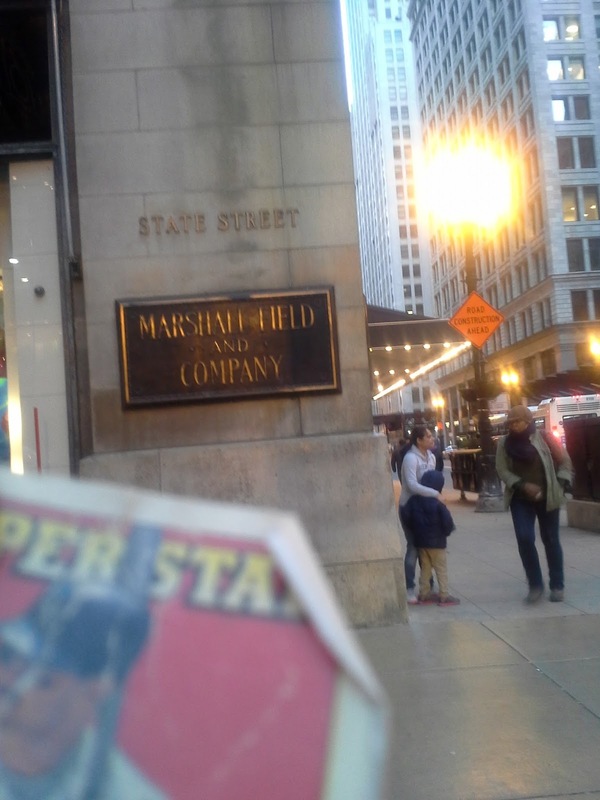 Marshall Fields was once an iconic department store brand based out of Chicago with locations throughout the midwest. 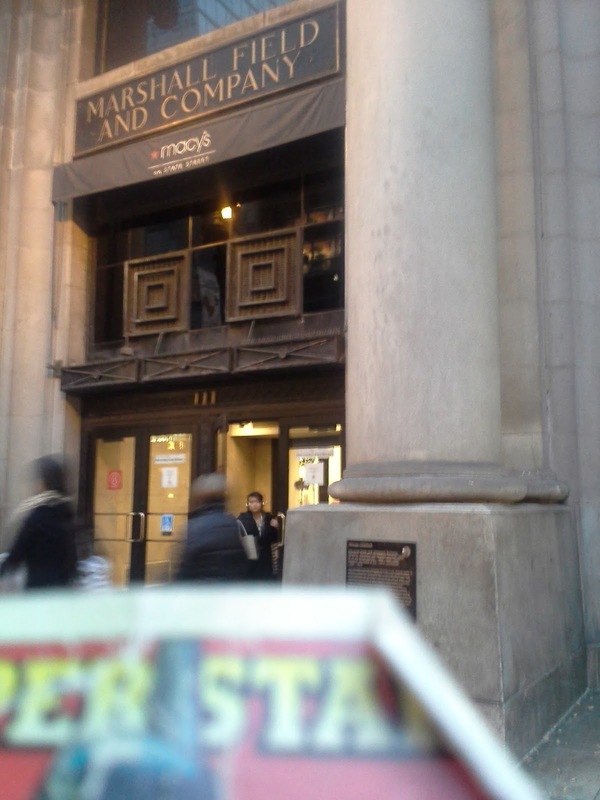 It ceased to exist when it was acquired by Macy's over a decade ago, yet it's name still emblazons it's former flagship location on State Street. Renay Bryand pitched in the Padres organization from 1988 to 1994. In 291 games, almost all in relief, he went 34-22 with 9 saves and a 3.81 ERA. A fuller account of his career can be found at The Greatest 21 Days. He is at Candy 'n Carmelcorn, which I wrote about with the 1987 set. Looks like he's standing next to some kind of Carmeldroid. Readers of this blog know I am a sucker for privilege signs - those once prevalent soda ads that used to be on most delis and coffee shops in New York and throughout the country. 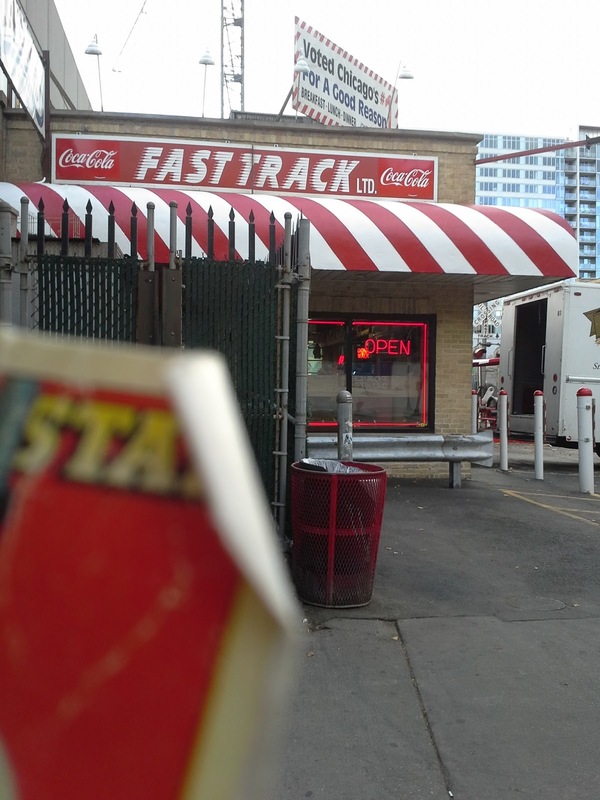 I was pleased to stumble across a modern version at a greasy-spoon called Fast Track. I had breakfast there and it was pretty good. The Coke signs are clearly modern; interestingly, if you look at Google Street View they used to have Pepsi signs until about 2010. The place seems to have been around since the early 1990s. Outfielder Brian Cisarik played in the Padres and Brewers organizations from 1988 to 1992. In 458 games he hit .275 with 12 HR and 168 RBI. He now owns several self-storage properties in the San Antonio area. I couldn't find anything online for Catherine's, it's not even in the 1982 directory, so I am guessing it didn't last long. There is a store called Catherine's in Spokane today, but it is part of a chain catering to "full figured women". The mannequin Cisarik is cuddling up to is definitely not the "full figured" type. When giving me the box Al pointed out a bunch of autographed cards. He explained to me that he bought the whole collection of a dealer many years ago and these were in there. There were no letters of authenticity so who knew if they were even real. All the cards are from 1986 and 1987. Assuming they are real, and I think they are, then I think someone was getting autographs at games in 1987 and these were the cards they had. I checked out autographs of all of these players online and most of them matched. I also noticed when doing this that a lot of players seem to have quite different autographs from item to item. I am guessing that over 30 years its not unusual for an autograph style to change. Looking at how spot-on most of the autographs were leads me to believe that they are all authentic. Al also said when giving them to me that "they are all no-names" anyway. I remember when names like Jack Clark, Willie McGee and Carney Lansford meant something. Dave Smith passed away in 2008, unfortunately putting a premium on his autographs. Certain teams are over-represented in these cards, leading me to believe the person who got these was going to games and getting whoever stopped by him. Two Redbirds and a Red. Wayne Tolleson is the only Yankee in the bunch. Lots of his autographs online look like this one where he appears to write "Wayne Games-"
A bunch of loose cards and unopened packs of "Steve Jackson Battle Cards" from 1993. You can find out more about this set from the Fighting Fantasy Wikia. Doesn't mean anything to me but maybe its a big deal for one of you readers. On the left, a few BMX racing trading cards. On the right are a bunch of "NBA Jam Session" oversize cards. All are Knicks. A shiny Japanese promo card, a Transformers sticker, a Flubber promo card that is lenticular (Sportflics-style) and a Pink Panther cereal-box give-away still in its wrapper from 1989. I actually recognized having it when I was a kid. A whole bunch of Fleer Double Headers, a few of which were dupes if anyone needs. Five Jose Canseco unlicensed Broder cards. The two night cards I already had. Night Owl - do you collect unlicensed night cards? The Puig turned out to be a dupe so is up for trade. A Jeff King refractor is so random but looks so great. He's got a lot of '14 Chrome and I seem to pick one up each time. 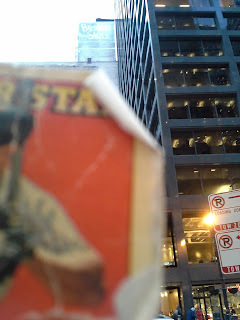 I was kind of annoyed I never heard about National Baseball Card Day until it was over. The Fielder and Arenado are my first two cards from that set. I stopped by Al's table the other day and he gave me back one of the Don Mattingly cards I gave him the other day, saying he didn't need any more minis. Then he said, "Wait, let me give you something to put it in." I thought he was going to put it in a plastic sleeve or something, but instead he put it in a handful of loose 1989 Donruss Rookies he had laying around. 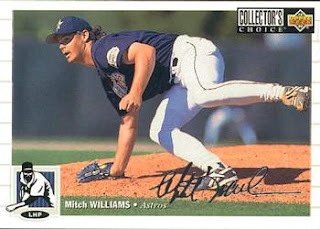 Mitch Williams was one of the top relievers in baseball in the late 1980s and early 1990s, saving over 15 games in a season six years in a row. His 192 career saves rank in the top 50 all time. Now the Partner in Expansion at RTC Transportation in Mt. Laurel, NJ. he kindly answered my questions about baseball cards. 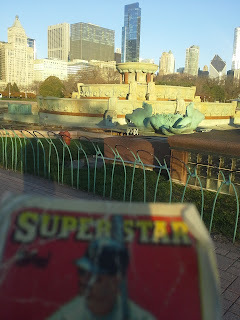 "I don't collect cards, I have an enormous amount of my own that companies have sent to me. As for a card story, the only one I really have is there is a card out there that has what is supposed to be my autograph on it, but it is not my autograph. That Cub card is the card that is not my signature. My actual signature is the one on the Houston card. That's how I knew that the Cub card signature wasn't mine. I never got very good grades in penmanship. I also knew no one would ever be able to forge that mess that is my autograph! My favorite card of myself is the card that has a fire truck superimposed on it. I don't know who produced it." The Bowman Platinum Jean Segura card looks great in person - the back reflects a bright blue or red depending on the angle. The Carmona card is a refractor and the Liriano is a sparkly green parallel from Topps Update. Catcher Dustin Garneau was the Rockies' 19th round pick in 2009 and made his major league debut in 2015. In 2016 he played in 24 games for the Rockies, hitting .235 with 1 HR and 6 RBI. He kindly answered my questions about baseball cards. "I don't collect cards. I have a few cards from thee minors I like but my first big league card is my favorite. Kind of like a self accomplishment seeing myself on one. I had a Mike Piazza card growing up I liked because I grew up a big Dodger fan from LA." 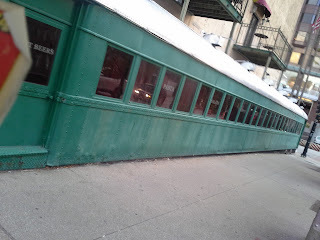 The Tutto Italiano restaurant in Chicago's South Loop was built into an actual Milwaukee Railroad car that was moved to Chicago in the 1980s. The interior does not resemble a train car but the exterior is all original. Outfielder David Briggs played in the Padres organization in 1988 and 1989. In 148 games he hit .203 with 2 HR and 54 RBI. He has recently worked as an electrical estimator in Pennsylvania. Weisfeld's was a regional chain that at it's peak had 87 stores in nine states. This was almost the end for Weisfeld's though; it was acquired by Sterling Jewelers in 1989. My company is based in Chicago meaning that I occasionally have to go there for a few days. Just like last year I took a few wallet card photos which I will show over a few posts. 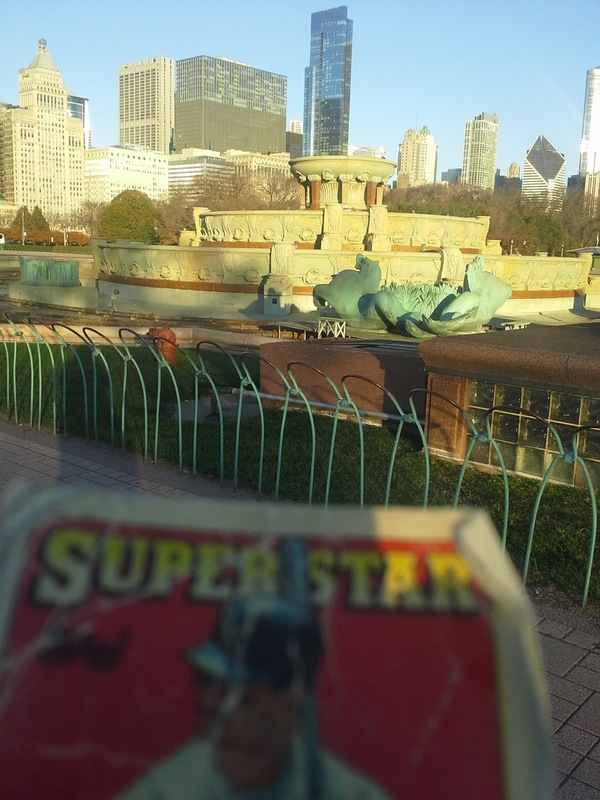 This is Buckingham Fountain, best known to non-Chicagoans from the opening of Married With Children - the fountain loses its water when Al Bundy flushes the toilet. I guess Al had just been going when I took this photo. Brad Hoyer pitched in the Padres and Red Sox organizations from 1988 to 1991. In 159 games he went 13-16 with 17 saves and a 3.63 ERA. A fuller account of his career can be found at The Greatest 21 Days. Rizzuto's Wide Shoes still has a store in Spokane. They list 15 brands on their website but not Naturalizer, the brand they were pushing back in 1988. Naturalizer is a brand of woman's shoes that originated in 1927. It is now part of Caleres, a holding company of various shoe brands. Nikco Riesgo payed six years of professional baseball. The 1990 Florida State League MVP with the St. Lucie Mets, he made his major league debut in 1991 with the Montreal Expos. He is now a youth baseball coach. He was interviewed in the recent MILB.com article on the set, saying "It was my first baseball card so I thought maybe that's just how it was. It was a great way to meet the fans. We might have seen the whole city of Spokane that day, and we were treated like the Beatles. It was the perfect place for us to interact with people." I interviewed him several years ago but he only mentioned his major league card, not any minor league ones. Not sure where he is in this picture - maybe Washington Photo again? He does look very happy to be there. Chad Kuhn was an infielder in the Padres organization in 1988 and 1989, hitting .184 with 10 HR and 43 RBI. Released after the 1989 season, he was picked up by the A's who saw something in his arm and converted him to a pitcher. 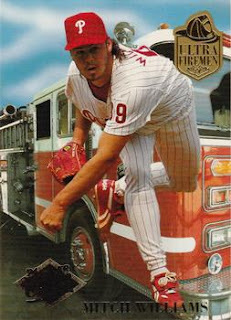 In 90 games between 1990 and 1992 he didn't fare much better as a pitcher, going 9-11 with a 4.50 ERA.He is now a phys ed teacher and baseball coach in Albuquerque, NM. A fuller account of his career can be found at The Greatest 21 Days. Hickory Farms was in the 1987 set as well. Kuhn looks like he works there and is taking an order. I was fortunate to win a recent contest from Baseball Card Breakdown and got some very cool cards. A Wade Boggs custom card that was actually autographed by the former Yankee star. Also a David Eckstein, a fun player and known to Star Wars fans as the husband of Ashley Eckstein who performs the voice of Ahsoka Tano. This picture didn't come out great but that Yordano Ventura refractor auto looks really nice in person - beautiful card. Plus a Yankee auto, prospect Nik Turley who is now in the Twins organization. Finally, some of Gavin's great custom cards. 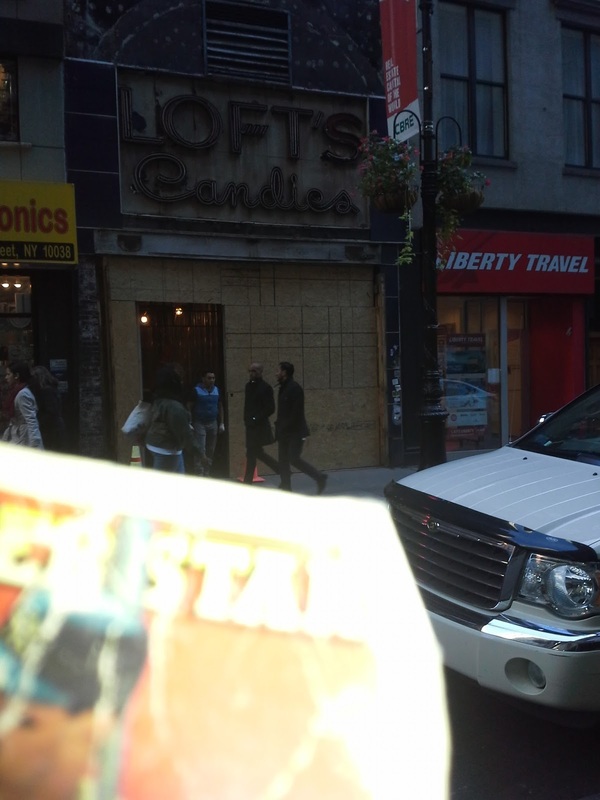 The first Loft's Candies store was opened on Canal Street in 1860. By the 1920s it was the largest retail company in the United States. By the 1950s the company had over 350 locations. That was the store's heyday, however; by the 1980's they were down to just a tenth of that number and the company closed for good in 1990. This beautiful neon sign for Lofts was recently uncovered during construction on Nassau Street in the Financial District. Infielder John Kuehl played in the Padres and A's organizations from 1988 to 1993. In 423 games he hit .261 with 45 HR and 282 RBI. Another one at Washington Photo. Once again they took a photo of a ballplayer holding a stuffed bear. This time I gave Al a few junk-wax Mattinglys. Next week I plan to give some Mattinglys and Roses from the various Fleer/Topps/Score/Donruss oddball sets I picked up recently - if anyone has needs from those sets let me know! Four other cards that seemed interesting and that Blogger insists on flipping sideways. I never had a pink border parallel before.